From the Baldwin County Courthouse, go east on Hancock St. one block. Turn right (south) on Wayne St., which becomes Business 441S. Follow Business 441S for approximately 4 miles to the intersection of Hwys 441 and 243. At this intersection, 441S goes left and highway 243 (the Gordon Highway) goes straight. Go straight and follow 243 south. Proceed 2.0 miles to Road 470 (Pancras Rd.). Bear right on Pancras Rd. Follow Pancras for 5.2 miles, where it becomes Union Hill Church Rd at its intersection with County Line C.C. Camp Road. Continue straight and follow Union Hill Church Rd for 1.0 mile to 206 Union Hill Rd., the old Newton homestead. Turn on the dirt driveway, just past the house, which leads to the barns. About 200 feet from Union Hill and on the left side of the dirt driveway is the cemetery. The cemetery is not visible from Union Hill Church Rd. 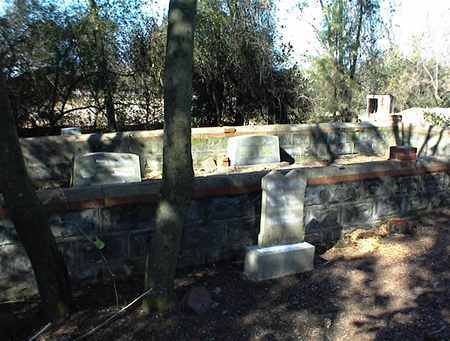 Cemetery has been cleaned and indexed by the Friends of Baldwin County Cemeteries, Inc. as of spring, 2001. "A Little Bud of Love" Inside the wall. "Father" "Asleep in Jesus" On same stone as Susie A. Inside the wall. "Mother" On same stone as Samuel J. Children of H. F. and E. B. Newton Outside the wall. "Of such is the kingdom of God" "Children of H. F. and E. B. Newton" Outside the wall. On same headstone as William Isaac. Children of C. I. and Z. L. Newton. On same headstone as Olive O. Children of C. I. and Z. L. Newton On same stone as Claude E. Outside of wall. A fieldstone marks the grave.